A paradise by itself, the island’s emerald bay with its superb sands and water is perfect for swimming and sunbathing with your spouse. Luxurious chalets on the island are a mix of Malay and Balinese architecture with the romantic background of the sea or the hillside. Couples can expect only the best facilities to pamper them, such as a jacuzzi, sauna, spa and posh restaurants. Tioman is a perfect getaway for young couples, with lush jungles from its central mountain creeping down to the white-coral, sandy beaches hugging the sea. For quiet strolls, there are easy trails leading from Tekek, the main settlement, northward to Salang and southward to Genting. Tioman is also a premier diving and snorkelling destination, and there are PADI dive centres in many hotels. 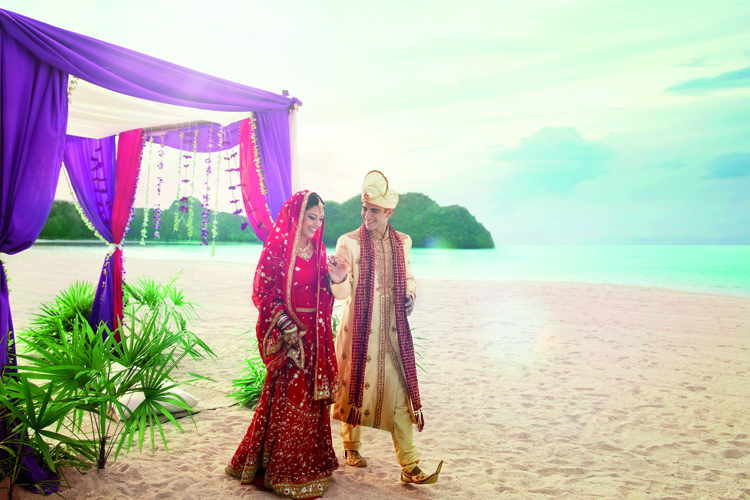 Escape into a fantasy with your beloved on the fabled island of Langkawi. Datai Bay, tucked in the northwest corner of Langkawi, is home to two sophisticated resorts overflowing with luxurious elements, such as spas and volcanic rock décor. Twenty kilometres away, Tanjung Rhu is set in a white-sand cove sheltered by a promontory. Langkawi offers many romantic settings for couples, so don’t miss out on spending quiet moments together on the serene islands of Pulau Pasir and Pulau Gasing. This one’s a honeymoon classic with choices ranging from sophisticated resorts to action-packed nightlife to exciting water sports along the beautiful and vibrant beach. On a clear day, you can enjoy the sight of a rock outcrop aptly named Lovers Isle, or spend time browsing through the many art galleries and antique shops. When the sun sets, tuck into a delicious ikan bakar (grilled fish) dinner in the alfresco restaurants or snap up some trinkets from the bustling sidewalk bazaar. For an outdoorsy couple, Malaysia’s premier hill resort, Cameron Highlands is the place to be. You can stroll through rose gardens or nurseries with brightly coloured flowers. Enjoy scones and hot tea with a breathtaking view of the terraced slopes of tea estates. A blend of idyllic beaches amidst interesting cultural sights makes for a stunning experience. A memorable river cruise up the Salak River or a dramatic sunrise with the conical peak of Santubong on one side and fishing boats and islands on the other is a perfect set-up for newly-weds. For sightseeing, a tour of the Sarawak Cultural Village at the foot of Santubong, with residents from the major Malaysian ethnic groups demonstrating handicraft making in their traditional houses, is a must. A 15-minute drive from Kota Kinabalu leads you to a stretch of dazzling white beaches. Keep the romance blazing as you go horse-riding on the beach or stroll hand in hand in the charming Prince Philip Park. A sunset cruise around the offshore islands aboard a Bugis schooner or deep-sea fishing in the South China Sea is a must-do. You can also enjoy a glass-bottom boat trip to Tunku Abdul Rahman Park and see coral reefs that are beautiful beyond imagination. Winner of Tourism Malaysia’s ‘Best Tourist Attraction Award’, beautiful Redang has many surprises for honeymooners. A quintessential tropical paradise, Redang gives lovers a chance to savour the thrills of its underwater Gardens of Eden. Cherating, with its endless palm-shaded beach, is dotted with the fisher-folks’ quaint huts. The rustic atmosphere soothes the senses, and a unique experience is watching green turtles coming ashore to lay their eggs at Pantai Chendor during the breeding season from July to September. Genting offers the Las Vegas style of entertainment – you can drop into the Casino de Genting and try your luck as newly-weds at the slot machines and game tables. If you prefer, go on hair-raising rides at the outdoor theme park. For quieter moments, there is horse riding at the Awana Horse Ranch. So, head to Malaysia for your honeymoon – the one place that offers you the most romantic getaways.